Syfy cancelled The Expanse TV show after three seasons, but now Amazon is reportedly very close to a deal to pick up a fourth season of the science-fiction drama series. Fans of The Expanse have been hard at work in trying to score a renewal. They even crowd-sourced cash on Go Fund Me to fly a plane bearing a #SaveTheExpanse banner over Amazon Studios in Santa Monica, CA, five days after Syfy confirmed The Expanse cancellation. A Syfy drama, based on the science-fiction novels by James S. A. Corey (the pen name for authors Daniel Abraham and Ty Franck), The Expanse stars Steven Strait, Shohreh Aghdashloo, Dominique Tipper, Cas Anvar, Wes Chatham, Shawn Doyle, and Frankie Adams. The story unfolds 200 years in the future, in a colonized galaxy, when two strangers are caught up in a vast conspiracy. Producer Alcon Television Group self-finances the series and, after the cancellation, made it clear you can’t take the sky from them — at least not without a fight (sorry, Browncoats). 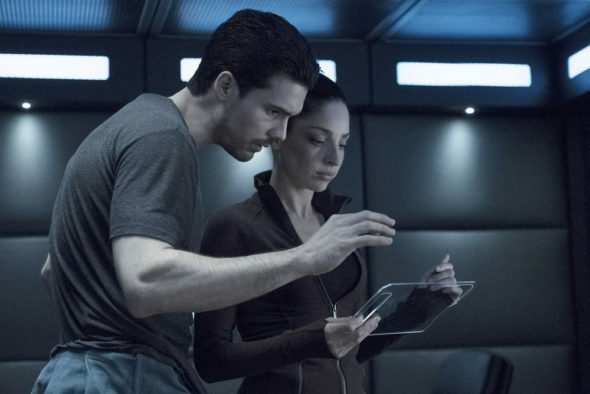 Starring Steven Strait and based on James S.A. Comedy’s best-selling book series of the same name, Syfy had only first-run linear rights in the U.S. to The Expanse. Amazon Studios had streaming rights to the first three seasons of the show. Sources say Bezos is a big fan of the book and was livid that the TV series went to NBCUniversal-owned Syfy. The move is said to have ignited Bezos’ demand that Amazon Studios brass find the company’s version of Game of Thrones. The Expanse was a pricey swing for Syfy and the nature of the deal put additional pressure for the show to perform on its linear network as the cabler did not have either SVOD or international rights to profit from. (Netflix had international rights to the series.) The Expanse was Syfy’s first major push back into the traditional science fiction genre. At Amazon, The Expanse will join a growing roster of genre programming including its upcoming Lord of the Rings TV franchise, Jordan Peele’s Nazi hunting drama series, Gillian Flynn’s Utopia remake, futuristic drama The Peripheral, from Westworld creators Lisa Joy and Jonah Nolan; Consider Phlebas and a reboot of Hanna, among others. The Expanse move follows a busy week of news on the broadcast side that saw Brooklyn Nine-Nine move from Fox to NBC after the former’s cancellation and Fox revive Last Man Standing. In both cases, the networks’ studio counterparts owned the show making the jump to their respective home networks considerably easier. In this case, Amazon had the SVOD rights to The Expanse, making a move to a different outlet more challenging. What do you think? Are you a fan of The Expanse TV series? Will you follow it to Amazon for season four? I enjoy watching the Expanse, but would have to wait until it comes out on DVD because of being on a limited income and can’t afford the extra monthly charge over cable. Mr Bezos… You are GREAT! This would be the best possible outcome with Amazon there is no network ratings or budget issues to worry about. Hopefully allowing this series the opportunity to run it’s course which I hope is another 3-5 seasons. This show could have been so much better. I am not surprised that SYFY cancelled it. The graphics were pretty good, but the storyline was terrible. Just imagine if they put this much effort, and more, into a show like Killjoys, or the other one they recently cancelled, or if they cancelled the Wynona Earp show which really is terrible, and others. COME ON SYFY, lets get a really good show working.